When you think of a fall wedding, you think of tones that are warm and inviting. You think of being cozy. And you think of leaves. At least, that's what I thought of when I was coming up with ideas for a fall wedding centerpiece. I also decided this was a good time to create a mason jar craft since I actually haven't done any of those on A Bride On A Budget yet, despite mason jars crawling their way into a ton of wedding themes. After a ton of thought (I actually enlisted three people to help), I came up with these mason jar luminary leaf centerpieces. They're perfect as a fall wedding centerpiece or a centerpiece for any other fall party you might be having. They were easy to make, although they did take a bit of time since I left them to dry overnight before finishing them. After I added everything up, these are under $5. For a centerpiece, that's an incredible price. 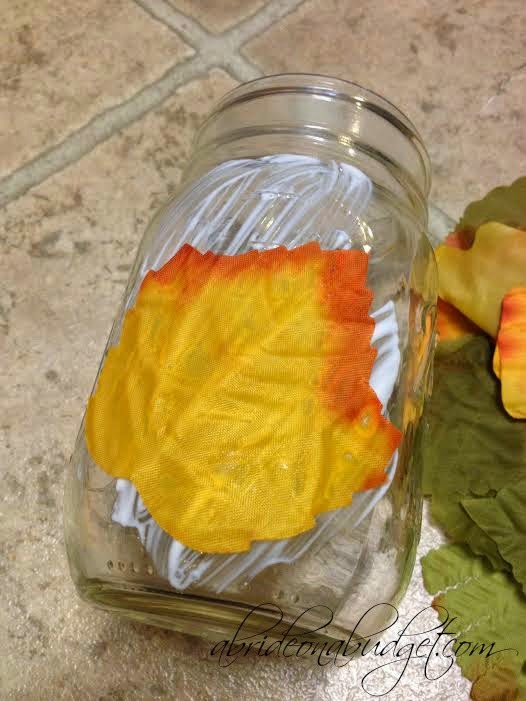 Paint Mod Podge on a section of the mason jar. 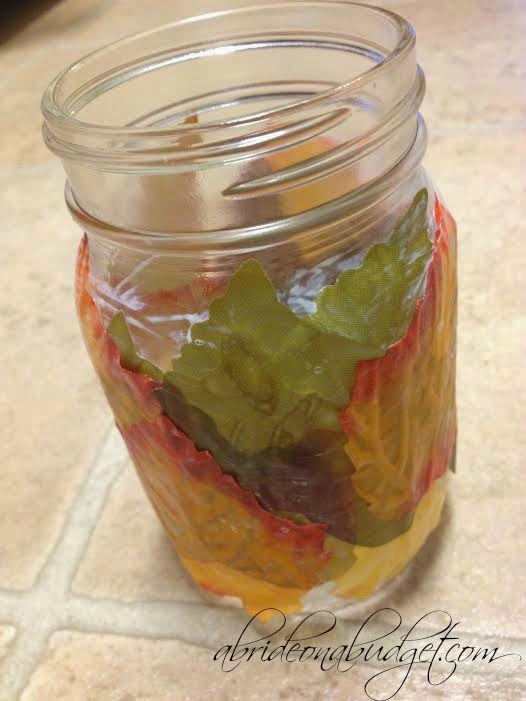 Stick one of the leaves onto the jar. Paint Mod Podge over the leaf. 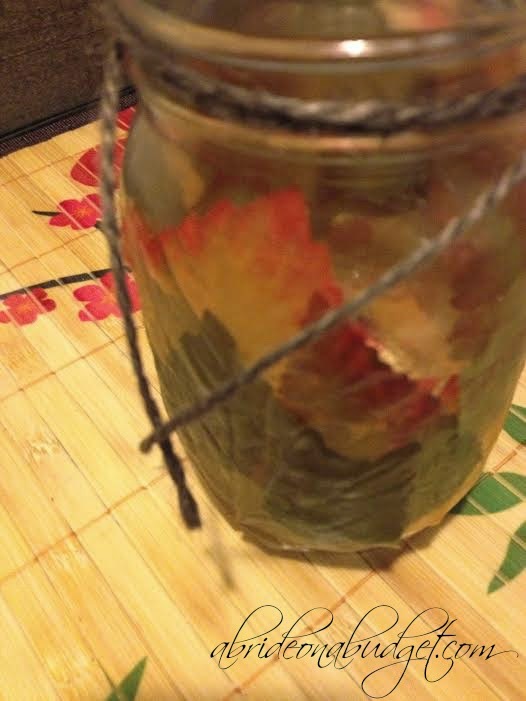 Continue around the jar, layering the leaves as you want. Now, this is a good time to point out that many of the leaves came folded. It was a big part of the reviews on Oriental Trading's site, but for this project, I didn't care. 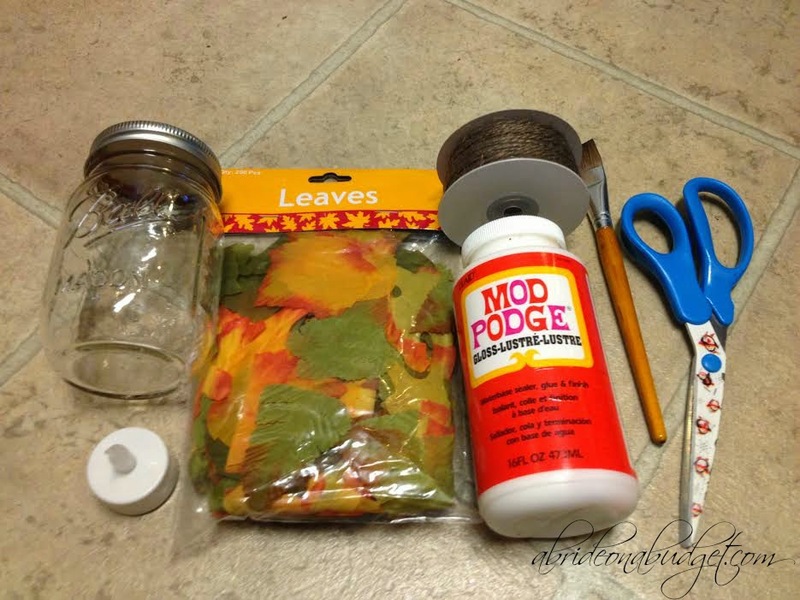 The leaves would be flat with a layer of Mod Podge over and under them, so folds wouldn't affect my project. If you were using these to decorate on their own, you need to keep this in mind. 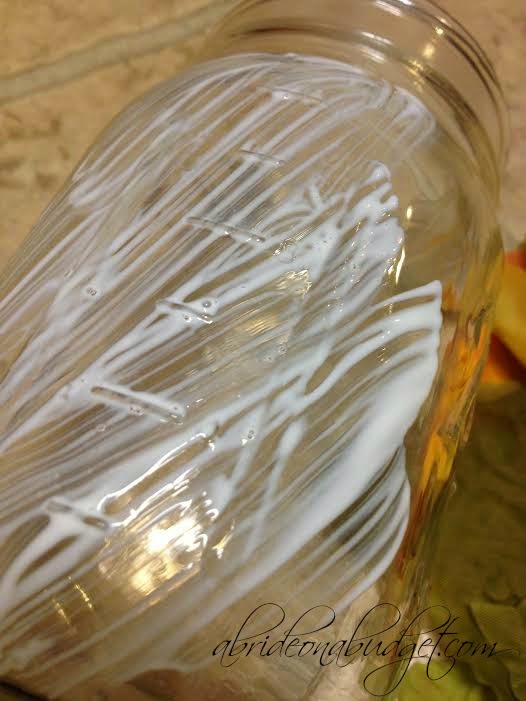 Don't worry about being neat with the Mod Podge or that you can see white on the jar. This will dry clear. At this point, leave these overnight to dry completely. The next day, wrap the jute cording around the top of the jar. Double knot it and cut the excess cording. 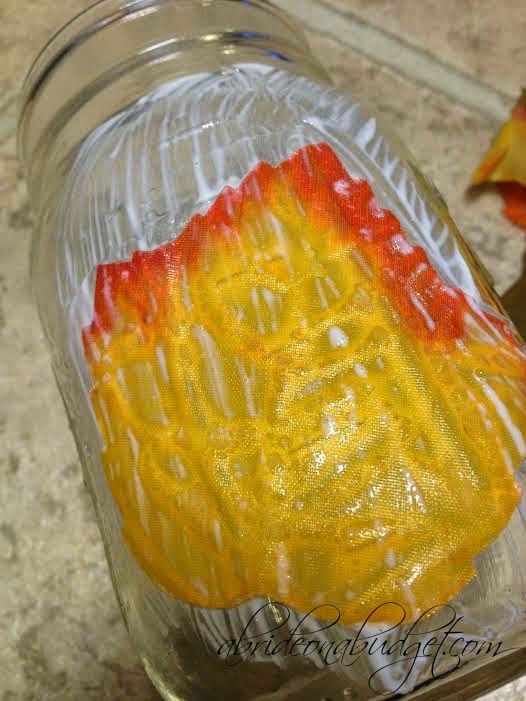 Drop a flameless tea light into the jar. 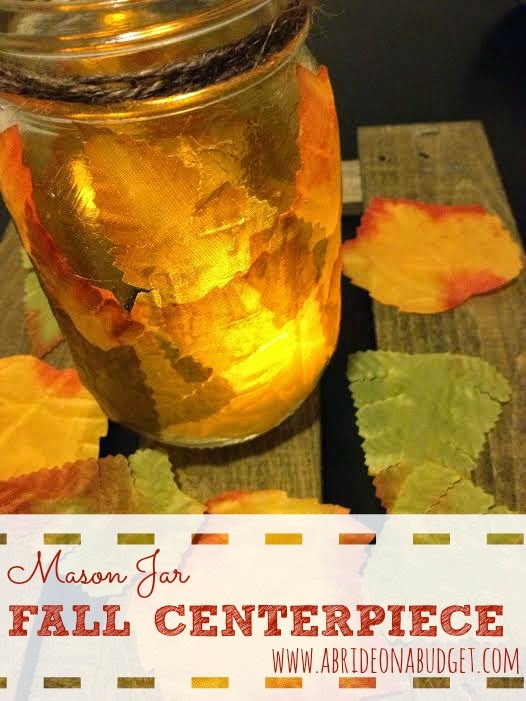 Scatter some of the leaves around as decorations and your mason jar luminary leaf centerpieces are complete. 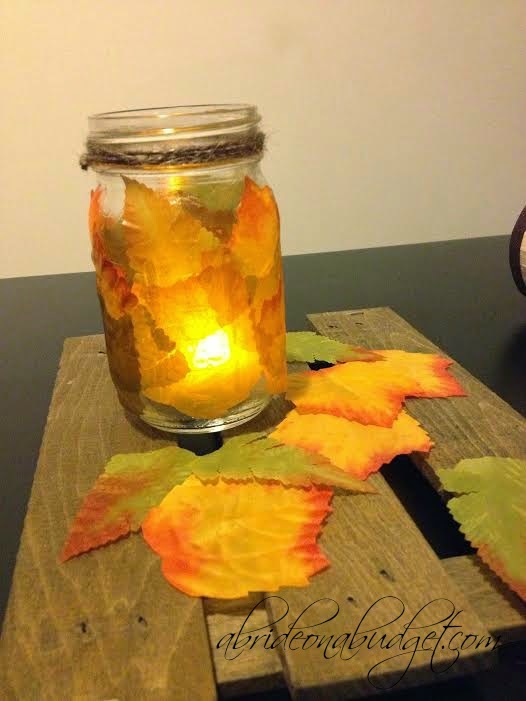 BRIDAL BABBLE: Would you make these mason jar luminary leaf centerpieces as fall wedding centerpieces? That is so pretty! Would be great for a fall wedding. Really cute and seems so easy. I really love this - I actually want to make these with my friends just to have around the home, much less as wedding decor - fabulous idea - thanks for the share!! What a great centerpiece, with a great price tag as well! I love mason jars! They are so versatile, one can do so many things with it. So cute! I feel like this concept could be used for almost any celebration! How pretty, and economical. I always enjoy finding new ideas to use mason jars. I think they multiply. 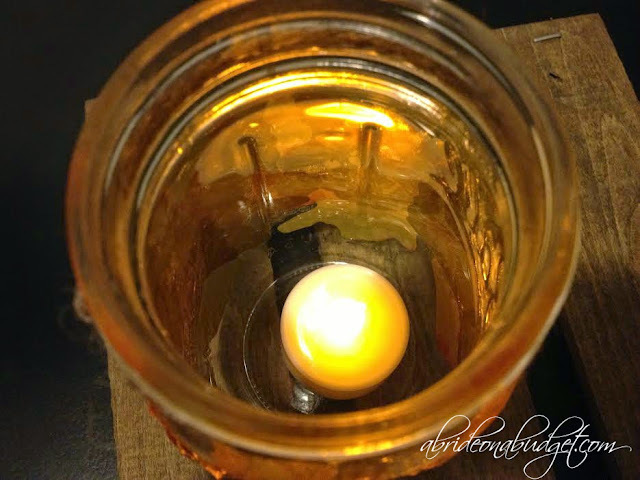 This DIY Mason Jar luminary leaf Centerpiece is Beautiful! SOO Perfect for a Fall Wedding! Its Amazing what people come up with for DIY Projects.. Thankyou for Sharing Yours. Omgosh these turned out gorgeous!! And what an amazing glow that comes from them!! So perfect for a reception!! I love this project. It is beautiful. Autumn is the prettiest time of the year. And what a great way to celebrate it! Nice! I enjoy the colors of The Changing Seasons. Very pretty and such a quick fall craft. Which is what I need right now! Thanks for joining the DI & DI Link Party. Soo pretty! I love candles in the Fall... they just add such a cozy touch. Thanks so much for linking these up to our Inspiration Galore Project Party. Pinned and saved.